We rescued Abbey as a crawling-with-worms-and-fleas five-week-old pup. She’s a seventy pound, six-year-old now, extremely attached to me and the most neurotic dog in the world. (My husband uses this fact to point out how dogs end up like their owners. I pretend I don’t know what he’s talking about as I check to make sure the coffee pot is off for the fifth time.) She’s terrified of thunder so during the summer she spends every afternoon shaking under the bed. Did I mention we live in Florida? She also has very poor social skills. After getting attacked at a dog park by a five pound dog, she is now insecure and very aggressive with small dogs. She’s a fast learner though, right? We tried trainers, who helped her a bit but never to the point we could trust her again at a dog park. So, we did what any sane dog parents would do. We got her a 180 pound mastiff to play with at home, Atlas. Atlas is truly a gentle giant and they are inseparable. But Atlas is also what one trainer called “an independent thinker” and not in a good way. Atlas can open doors … with door knobs. Also, he’ll only listen to me if he first thinks my request through and decides it’s in his best interest. He’s truly the smartest dog I’ve ever had. His favorite show is Game of Thrones (I think he has a crush on a certain direwolf); he won’t do tricks for anything less than peanut butter slathered apple slices and his favorite place to nap is on my yoga mat. 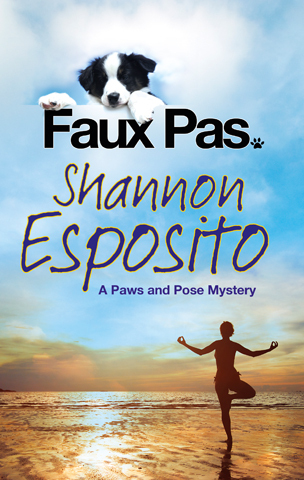 In fact his obsession with my yoga mat gave me the idea for FAUX PAS, the first book in my new Paws & Pose mystery series. I can’t imagine my life without these two, and not only because they inspire my writing, but because they are the greatest teachers of unconditional love on the planet. Shannon Esposito lives in a magical gulf coast town with fluorescent sunsets, purple dragonflies and the occasional backyard alligator. Her mysteries transport readers to Florida without the hefty price of airfare. Although she knew from the age of five she wanted to be a writer, she briefly entertained the idea of being a scientist, until she found out it involved math, which gives her hives. She shares this little corner of paradise with her husband, twin boys and dogs. If she’s not writing, you’ll find her coddling one of the above, hiding with a book or daydreaming with her toes in the sand. You can visit her at murderinparadise.com FAUX PAS is now available in the U.K. and will be released in the U.S. in December.